The Atlanta Braves plan to build a new stadium in Cobb County and move there from Turner Field at the start of the 2017 season, team officials said Monday. Braves executives John Schuerholz, Mike Plant and Derek Schiller, in a meeting with a small group of reporters, said the new ballpark will be built at the northwest intersection of I-75 and I-285 in the Galleria/Cumberland Mall area. They said the team has “secured” approximately 60 acres of land for the project. The Braves said the stadium is projected to cost $672 million, including parking, land and infrastructure, and will be built in partnership with Cobb County. Schiller said the Braves will be a “significant investor” in building the stadium but refused to disclose how much the team will spend. “At this point in time, we are working with Cobb County, and when those details of our exact arrangement become final, we will let you know,” Schiller said. The Atlanta Braves are going to be calling a new stadium home in 2017. This will be the third stadium the Braves will play in since 1996. 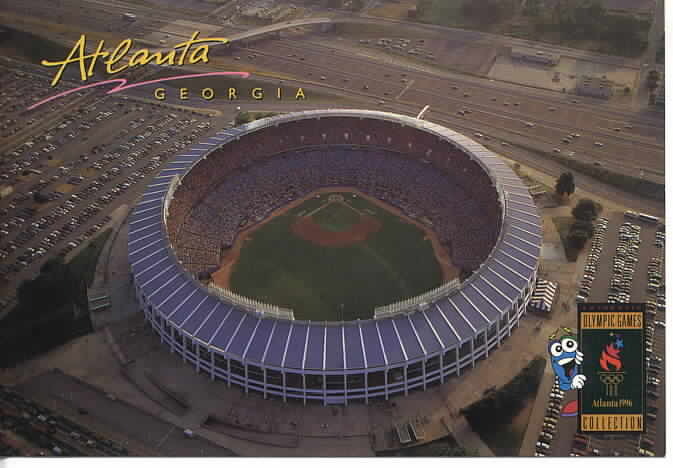 The Braves played in Atlanta-Fulton County Stadium until the end of the 1996 season, when they moved into Turner Field. Turner Field was originally built for the 1996 Olympics in Atlanta, once the Olympics ended the Braves signed a 20 year lease which ends in 2016. Well, I’m glad I made it to Turner Field before it closes. I went in the Summer of 2003 and was able to see a Braves win over the Arizona Diamondbacks with home runs by Gary Sheffield and Marcus Giles. I was used to going to Fenway Park and not being able to bring anything into the stadium. When we showed up people were bringing coolers into the game with bottle waters and soda, people also brought in Kentucky Fried Chicken, I was in shock! I hope that I will be able to make it down to the new stadium in Cobb County, I see a road trip happening in five years. I love the fact that they are lowering the capacity to make it more intimate, less open seats in between fans will help with a home field advantage. Let’s Go Braves! Who’s ready for game 6 tonight? I’ll be honest that since the Atlanta Braves lost to the LA Dodgers I have not followed baseball at all. My friend called me a fake Red Sox fan and guess what? it is true because as he knows I am a Braves fan. The World Series has been great with all the controversies and weird plays, I probably will only flip back and forth from the game tonight because I don’t want to jinx the Red Sox, but I will make sure to watch long enough to see the Dropkick Murphy’s kick the game off with our National Anthem! They are sure to get the crowd rocking and help with the home field advantage. Hey Red Sox Nation, time to get #Bostonstrong. Good Luck Sox, finish them off! P.S. Do it for Tessie! The Atlanta Braves pitching staff has not been able to slow down the LA Dodgers potent offense, meanwhile the Braves offense (not counting game 1) has been doing enough to win these games. Now the Braves have to rely on Freddy Garcia to get them back to Atlanta for a game 5 match-up against Clayton Kershaw. The Braves have had the breaks go against them many times this year and have responded each time, leading the MLB in come from behind victories. Can they do it again for the series? This is going to be a tough task and it starts tonight at 9:37 pm EST on TBS. As you can see the Braves took the season series 5-2, but most will argue that is when the LA Dodgers weren’t playing their best baseball. Although Yasiel Puig did come up and hit a grand slam on June 6th to start the spark of the LA Dodgers. Can the Braves overcome their strikeout problem? The Braves are feast and famine on offense, it almost feels like it is either a strike out or a home run. 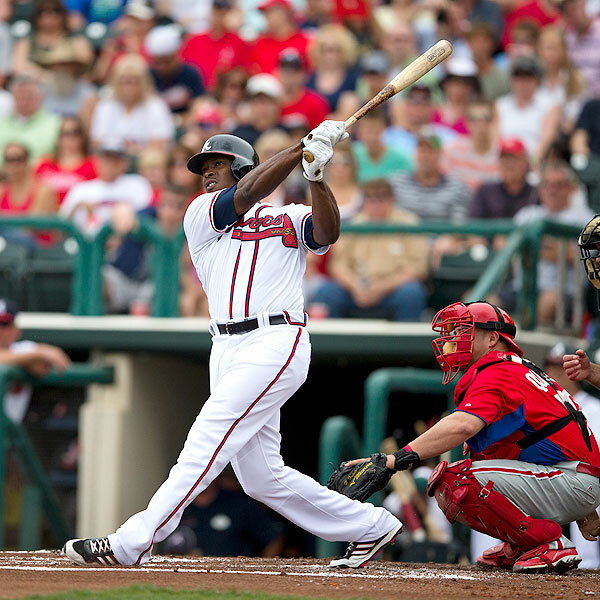 The Braves hit 181 home runs this season (most in the NL), but only hit .249 (bottom 6 in the league). The good news is the Braves walk a ton and their on base percentage is in the top 5 of the NL at .321. If the Braves can get the Dodgers starters out by raising their pitch totals they have a chance. The Braves pitching staff is the opposite of the Dodgers, the relievers are #1 in MLB, but the good news is the starters are also pretty good sitting at #5. The top 3 pitchers for the Braves, Kris Medlen, Mike Minor and Julio Terehan have all had moments this season of dominance and need to find it during the postseason. The Dodgers offense started off slowly this year and then Puig comes up and Hanley Ramirez gets healthy and boom there goes the offense. They moved up to #7 in offense by the end of the year. 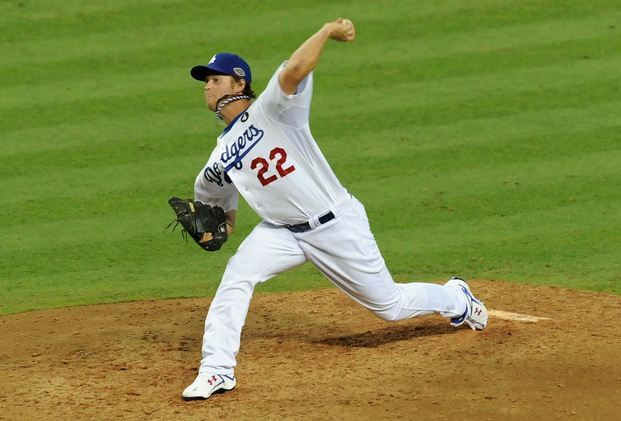 Can the Dodgers offense get to the Braves relievers? Can the Braves starters make it through the 7th inning and make it a 2 inning game? I got the Braves in 5, the Braves have the best home record in the NL and I think that the trend stands. Not many players on either team have been to the playoffs before so I don’t think that experience is going to play a factor here. SI Puts the Uptons on the Cover…That Includes Kate! Low and behold Kate Upton is wearing a Braves jersey and that makes me happy. What makes me sad is I don’t think I am going to be getting this Sports Illustrated cover because it is regional. I love the idea of the trio of Upton’s being on the cover, but why are they? I understand Justin Upton because he really carried the Braves to the best record in baseball in April and a big division lead. I can get with Kate Upton because well she shares a name with Justin and BJ and let’s be honest, she is a good looking female. The one that kills me is BJ Upton, only one regular player in the MLB had a lower batting average than BJ, but he has to be on the cover in order for it work the way they want to. Don’t get me wrong if BJ turns around and hits .320 and 12 home runs during the playoffs I will forget his terrible regular season. Keep your eyes out tonight for my Braves playoff outlook. Hey bro, set up the funnel! 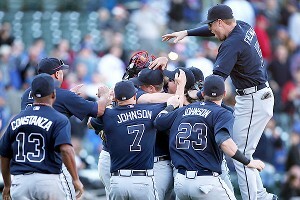 The Braves finally clinched the National League East division title yesterday in non-dramatic fashion. In the 6th inning of the Braves vs Cubs, the score of the Washington Nationals loss posted at Wrigley Field. You could see the Braves get those smiles on their faces and hand out a few high fives in the dug out. 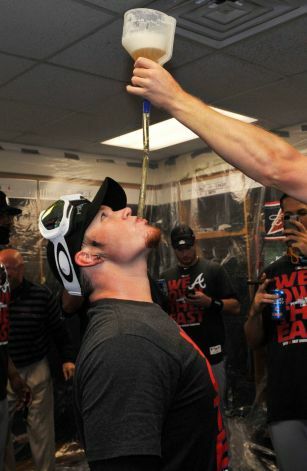 The Braves went out and finished their win over the Cubs and that’s when the celebration began. 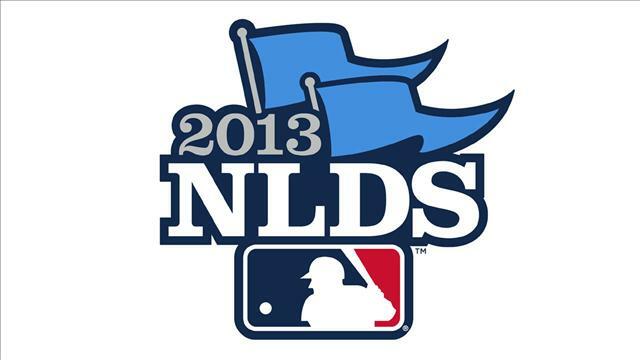 Congrats goes out to the Braves for winning a division that was handed to the Nationals at the beginning of the year. Congrats to the Braves for fighting through injury after injury. The Braves can’t settle here they have to keep fighting, like Freddie Freeman said “This is only one celebration of four, hopefully,” Next up is earning the best record in the National League and getting home field advantage through the playoffs. 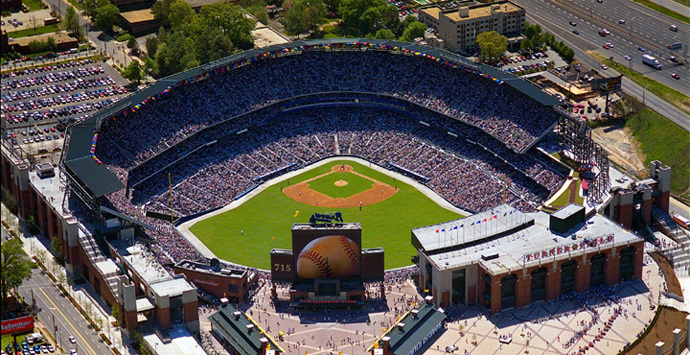 The Braves are 52-22 at Turner Field this season, so home field is very important for the Braves. The Atlanta Braves blew a 5-1 lead yesterday against the Chicago Cubs, but put up 4 runs in the top of the ninth to clinch a tie for the NL East title. The Braves play the Cubs today 4:05 pm with a chance to join the Boston Red Sox and Los Angeles Dodgers as division winners. 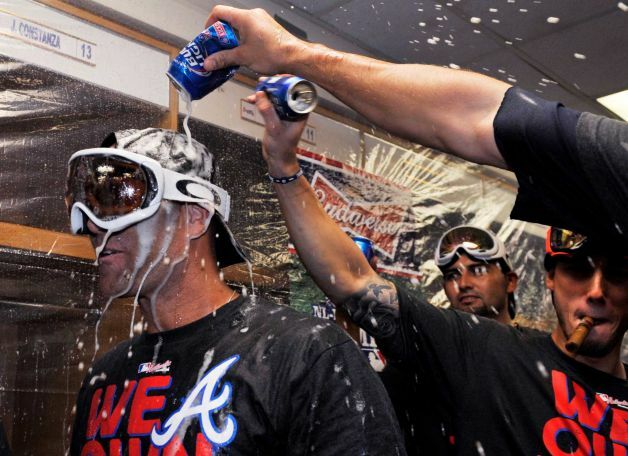 This will be the Braves first division title since 2007. Let’s go it Braves! P.S. Jason Heyward was back in the lead off spot for the Braves yesterday! Do you remember THIS?